The late Christopher Hitchens did say “I became a journalist because I did not want to rely on newspapers for information”. That was before SM exploded and now you know not many rely on the MSM for news. The one calling Modi “incorruptible’ was one Manoharsinh Jadeja of Rajkot who is a Congress member. But then Congress’s “independent” poodle NDTV saying that would be blasphemy. So they claim Jadeja is a BJP member. It doesn’t matter to these morons that Assange or Wikileaks is not in the business of giving anyone any certificates. Content appearing in cables leaked by Wikileaks is credited to them as source and that is all. But even in resting a controversy Barkha shows you how “independent” she and NDTV really are. 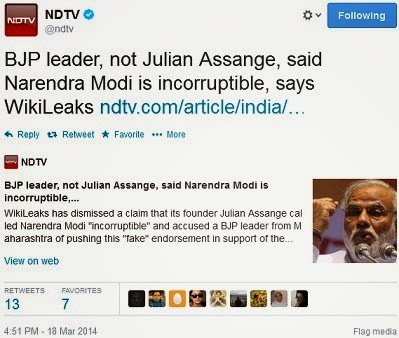 And don’t buy the BS that this was some honest mistake because NDTV has done this 786 times before; quite deliberately. Now compare the two letters and the names in it. In the report by The Hindu there are many names which most people haven’t even heard of but they are supposed to be “prominent”. I have heard only of Ram Puniyani from the list. But hey; when this was published Rajdeep had nothing to complain about. Why? Because these worthies were opposing Modi and were claiming Modi was a threat to India which is line with Rajdeep’s political ideology which he cleverly peddles on CNN-IBN. 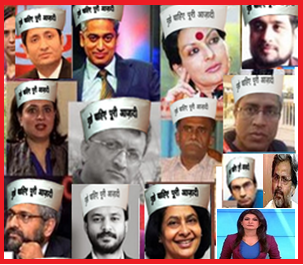 The entire team of IBN has been an anti-Modi gang of crooks which is why AK spared them from “jail”. But oh, if anyone writes a note critical of AAP then their masks are falling off. 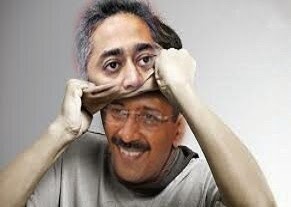 All I can tell Rajdeep is that his own mask had fallen off long back and every observer could see it. Now it’s his pants falling off, just as PP Bajpai was caught with his pants down. There is no place to hide for Rajdeep anymore. 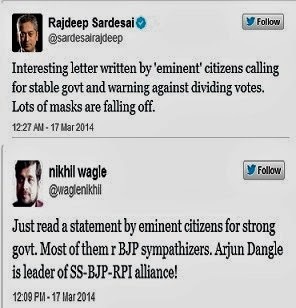 Can Rajdeep offer the excuse that he wasn’t aware of this letter? Not really, because The Hindu crook, N. Ram, is on his channel frequently and I’m sure the two share the gossip on politics. Last night (March 18), both Barkha and Sagarika were at Varanasi doing shows over a Modi Vs Kejriwal contest. The response by the public must have shown them who the people back. The anger among the media-AAPTards is because their fearless leader AK has goofed up too often and they don’t have any more defence to offer. In their long losing campaign against Narendra Modi it was Kejriwal who gave them some new hope. However, almost everyone on SM is a journalist now as the above video shows and there others who are trashing Congress ads with parodies. Nobody watches Barkha, Arnab or Rajdeep for news anymore. They keep proving they’re the lowest BAR of news media. Arnab will survive because he is not corrupt and his integrity is not tainted. I cannot say the same for the rest. People are coming together over Modi and so is the media; both for different reasons. "People are coming together over Modi and so is the media; both for different reasons. " - You hit the nail on the head. just want to kow your views on recent developments in crimea..and what stand india should take?..I have a view, that its better for india not to take any stand and be neutral,as i see russia is ocupying crimea and western world countries are just trying to single out russia...both are doing the best worst... But still i am thinking india shud support G7,as they are democratic countries..what do you say Ravinar? Although you asked Ravinar. .. I found your question very interesting to reply to. For one. . Russia is more credible ally than any India has/had. Two if India supports Russia then indirectly we are supporting the referendum. It will then be difficult to distinguish between Crimea & Kashmir. Last I heard. . India has backed Russia. Thanks nupster....so better to be neutral. ganging up against NAMO....similar to scene from film 'Deewar'...key to Delhi will be taken by NAMO from the pockets of his adversaries.....it will be 'Agnipath' with a different end. Dirty tricks department is trying very hard. I wish a video exposing RS is released soon, some people really need to see his true color. Excellent post! I hope Rajdeep's days are numbered at IBN. Ravinar, would you ever consider being an anchor in MSM ? Bcos that would be an awesome news for all your fans. I bet TRP of your show would be practically unbeatable. Even Arnob will have to make a run for his money then. I confess.... I do watch MSM.... not because I believe them.......but to know how a self declared, so called fourth pillar of the democracy is corroded and rotten from inside.Watching MSM gives me a solid understanding to appreciate social media expose. What ever AK49 said regarding corrupt media and editors should have been said by NaMo/BJP for 12 years hounding by MSM. But he never uttered a word. He simply ignored them. But look who is saying this? The so called Massiha of democracy who is giving lectures to others on how to run a democratic party. Irony is this Massiha is prompted and promoted by the same gang of MSM. I do not watch MSM but I guess there is no harm if you are watching :)..it's important that nationalists watch MSM and let the whole India know what they are. These guys have run propaganda up opposed for years and it's only when people like you watch them we know what their true colors are. Beg to disagree! Watching them give them TRPs and credibility if you respond.Like Modi , we need to learn to ignore these crooks completely. 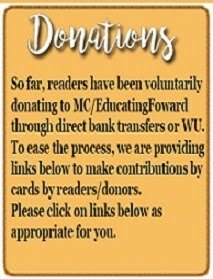 Do you still use Post cards/In land letters/telegrams? Liberal mainstream media and their political correct views will continue. Until the elections and after that fact, Modi will continue to be looked at with the same talking points, whether PM-ship beckons him or not. There will always be a spin. People will listen and watch media outlets that fit their beliefs. It is indeed difficult to consider another's point of view. And that is where assault on honest debate starts. Thugs are graduates from ivy league colleges with polished English, thats the only difference between them and commoners like us ! A timely article and as usual hits the nail on the target - SM has more talent and importantly more passion on its little finger than all the journalists in MSM put together. Few days ago, Barkha Dutt was lamenting about irrelevance of journalists in this election. She's right, MSM and especially news channels have become irrelevant for me because of journalists like her. Barkha and her ilk offer me no new ideas, perspective or knowledge. They follow the same beaten to death secular-communal topic as understood in their worldview, which is extremely inhibiting for me as a news consumer. An e.g. of their jaded journalistic skills was yesterday's theatrical boat-ride reporting at Varanasi by the ideological twin sisters. Ordinary people they interviewed displayed immense intelligence and maturity through their answers in response to the moronic and motivated questions of these two worthies. I was an avid user of print media right from my school days and then an ELM user subsequent to exploding of news channels. In the last 2 years since I became an active social media user, I use newspapers or TV only to observe their new spin or excuse on behalf of Congress. I can confidently say, I learn new things and gain new knowledge through social media and bloggers than from MSM. I turn to R.Jagannathan to understand about economic and political issue of the day. I read Pioneer (though it's a newspaper, for me it's social media since I read it online) for investigative stories. When RTE was introduced I learnt details of this law, it's pros and cons from http://realitycheck.wordpress.com/ . I want to LOL at home after a tiring day by some intelligent satire, I turn to Unreal Times. Saving the best for last, I turn to @mediacrooks for best analysis of journalism, ideas of leadership and management and even about movies, all wrapped together in beautiful language. If MSM is really serious about getting back it's readers and viewers, it need to do a ruthless cleansing of the existing lot of media celebs like Shekar Gupta, Barkha Dutt, Rajdeep Sardesai, Sagarika Ghose and even Arnab Goswami to name a few. A new breed of editors and anchors led by likes of Anubha Bhosle, Suhasini Haider, Gaurav Sawant, Jaggi, who are not compromised by prejudice, hatred, could bring in a new lease of life for MSM. Else, I am a happy to continue being a consumer of blogs, online news portals. As for Barkha Dutts, they can continue to find solace in their Lamentations. PS: Apologies for the length, but couldn't shorten it. Dear Kalps1616: Endorse each and every word of yours as also each and every blog that you have named. Personally I find Gaurav Sawant the most patriotic and nationalist journalist and Rajat Sharma of IndiaTV the most politically savvy. Excellent comment. For last 4-5 posts by MC, I find your comments to the point, well put and also in good language. Why don't you take guidance from Mr. Ravinar and start your own blog ? I am sure, you will be successful. Mr. Ravinar, as usual THE BEST article. God bless both you and kalps1616. Earlier, for both news and opinions, I used to read articles online in the TOI, The Hindu and The Hindustan Times. Now, I first login to twitter for news, and read the articles recommended by a few people whom I trust. I then quickly scan the sites of major newspapers, not for news but for opinion articles and read the ones which I feel like. Social media has completely changed the ways of "news consumers." So these two item numbers are out in Varanasi! Already seen you with pants/skirts down. Hey, it's not 2002. People more awaken with sharp weapon of SM in hands. Are u ready for a Harakiri? Ravinar. Escellent as usual. You have hit the buss eye. RS & C5M wuill scurry for cover henceforth. In one of my earlier comments I had mentioend that AK is a spent force and he will not be of use anymore. One final drama by AK can be seen on 23rd Mar 2014 when he may gladly announce that he may not contest from Varanasi. I have a request - if possible, can you write one post everyday till elections are over. Thanks a lot once again. MSM could be on its last leg.Who will fund them after June 2014? They are not used to reporting on critical issues of development,new govt programmes/initiatives etc.Post June 2014, we may have completely revamped DD channels to put all these crooks to deep sleep. One can see the terror in the eyes of all these so called PIMP MSM celebrities. In their hearts they know well their sultanic days are already over and now many of them stare at the rude reality of going behind bars for ll their financial misdemeanors by colluding with the corrupt CONs in laundering their red money and thereby enriching themselves financially. NDTV-Chiddu , Chordeep having a 50 + crores bungalow are just tip of the ice berg. If at all NaMo comes to power one of his initial tasks should be to clean these venomous pests who in the garb of journalism have stooped down to the lowest levels and fooled the citizens. Excellent Article! I guess more citizens (and their families/extended circle) should be connected to SM. That probably will bring in the much needed change to the current MSM cronies once the TRP falls. Dear MediaCrooks, your handle which gives the impression of being a neutral critic of MSM is bogus. Your criticisms are not objective and not based on established principals of media ethics, or logic but from a very narrow BJP/ Sangh Parivar propagandist. Please don't fool people with your partisan propaganda! Dear AAP karyakarta kindly spread your psuedo-neutral but proxy-antinationalist propaganda only to minorities or folks who are ex-congressis.PPl like you will still worship naxali-clown kejriwal even as he was exposed big time while romancing in bed with AAJTAK aka AAPtak...have a good KRANTIKARI DAY ! Translation: Why aren't you a pseudosecular hypocrite like me and all my Oxbridge/JNU educated heroes in MSM? @Ravinar , I think you should definately add ABP NEWS as the biggest pimp of ANTI-MODI BRIGADE , The wikileakes news was runned by them over and over again and in a way that it would make BJP look super bad ,in their every debate-show topic is twisted against Modi and Bjp ,they also will bring some weak Bjp panelist who cant talk properly and more often he would be outnumbered by SECULAR REPRESENTATIVES. 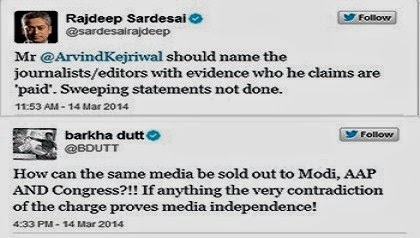 BJP are not handling media well as they never counter effectively and Ravinar watchout for NEWSX too who have a chief editor by name Preeti sehegal and she has openly flagrantly spreaded antimodi propaganda on her EXPERT-PANEL WINDOW many times...lastly it is briliiant that naxali-clown aka kejriwal is parading with skull-cap or minority-topi and i hope everyone out there with any amount of brain-cells in their head will realize what a big and dangerous leftist-pimp this guy is ! The above is an interesting piece that I found on SM. I am surprised how the author of the above piece missed the journos.Generally they are the ones who are making a living by just learning a language all their lives and read the dirty history and literature created by their ex-professors at blatantly anti national institutions (or are they assembly lines of Nehruvian pseudo siculiar liberals) like JNUs , St Stephens and Doon schools.Generally these are virtual dropouts at school levels as they choose the easiest art streams and aided by the push of their family connections, reach domains of power and start ruling every one of the above class. Communal and caste politics will come to an end ,If we people start demanding real things like Water/sanitation/electricity and not give into caste/religion/reservation bribe they try to. These are all like subsidies, ultimately we suffer more as we pay much more than what we get for free. Even after Modi becoming PM, severe and numerous oppositions will be there. The first thing if BJP forms the Govt should be sealing the borders of India even with nepal and bhutan. Then make every money transaction electronic. Problems are not only in news-media/ business but also in entertainment business too .Its open for all to see bollywood is ruled by khans and anything in name of art is acceptable , nowdays that guy KAPIL SHARMA is earning crores by presenting cheap comedy based on characterless female members of a hindu family and everyone is applauding and calling hime comedy-king , i wonder if Kapil enacted the show as Bittu khan or etc then what the reaction would have been , i am sure he would have been arrested or atleast whole MSM would have declared how minorities in India are in despair and exploited but our minds are trained to live in fiction , although reality is that hindus are the ones who are exploited bu HINDUS themselves ....Beware of frauds and wolves !!! I agree with you on this. I have watched comedians like Raju Srivastav and Sunil Pal; they were quite modest than this loose character Kapil. I found that this Kapil Sharma is shameless person. Problem is people are shameless so they applaud someone who is expert in presenting shamelessness in the form of comedy. I used to follow MSM like any other AAM AADMI till few years back. But since I started following SM and starting reading such eye opening writings, I stopped watching most of these paid news channels. Yes sometimes, already loaded with right news and correct information, watch their shows to have some good laugh..to see how they spin the news. It is a real fun to listen them once you know their intent. Just one word solutions to all problems, modiji style, VIKAAS! I dont understand why CNN-IBN is covering AK 24x7. Political beliefs apart isnt it business wise suicide. Why are the owners allowing this? I am sure they have turned off whatever little viewership they had with this sort of biased coverage. when this club of corrupt journalist punished for the misdeed and misinformation spread all these years. To see S.L.Bhyrappa's name is a revelation. Great kannada author. I have been reading his novels since class VIII. Such intellectualism can be seen rarely. There are plenty of such kannada authors who have contributed to my intellectual growth and limitless thinking, viz., K.T.Gatti, Beechi, Yashwantha Chitthala, Shantinath Desai, Vyasaraya Ballala, et al. All great in their own way. I do have respect for MVK AND MJA. Your second list is completely alien to me as I hve stopped newspaper as well as watching news channels. My only channel is visiion TV shiksha of brahmakumaris. Just for the curiosity sake, let us compare the intellectual levels of the two 'prominent group of people'. 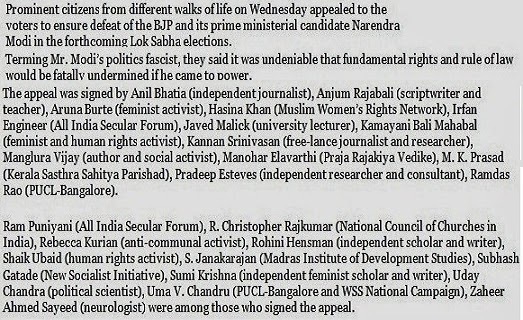 First group of prominent people, called Modi fascist. Do they even know what a 'fascist' is? Are fascists democratically elected leaders? To their knowledge what Modi has done that would be equivalent to what fascists are known to do? Who gave these group of people prominence? 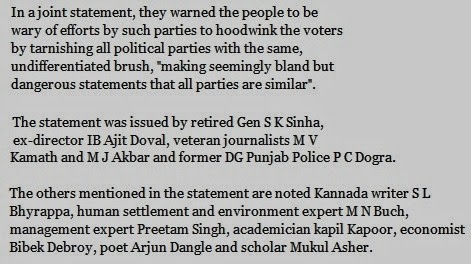 The second group of prominent people are asking AAP (without naming it) not to put all parties as equally corrupt. Is it an unreasonable request? Can any party match UPA II in corruption? Excellent post to say the least. But disagree with just one statement: "Nobody watches Barkha, Arnab or Rajdeep for news anymore." This is not true. You are right that nobody watches Barkha or Rajdeep for news anymore, but there are some dedicated regular viewers for Arnab's show. The reason is what you said later in the same paragraph "Arnab will survive because he is not corrupt and his integrity is not tainted." Excellent, well-researched article. I have been closely following your blog for the last one year and became a fan of you. I even got inspired to start my own blog (www.pensivenetizen.in) to put forth my opinions. bacteria-kejriwal did not threaten the media out of the blue. 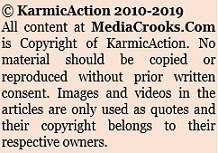 well, the strategy was - to absolve media of every allegation, accusation & affirmation of promoting dalaal, dalaal & only dalaal in present scenario & future’s grand scheme of things. I am not good in english like you all people but thank you very much sir for widening our political views. Looks like the world press will start making amends, and be peace with Modi..soon..a good start..though very mild. As Rajdeep, Barkha and alike are fighting their last battle, we will find more filth, lies, hypocrisy, double speak from them. And in the process every thing of their from within and outside will fall. And for Arvind Kejriwal his great strength is bewitching asinine henchmen. Yesterday I was watching Rajdeep interview MJ Akbar. It was very evident that Rajdeep did not like MJA join the BJP and the kind of questions he asked all revolved around Gujarat 2002. So much for his neutrality and progressive thinking. He kept coming back to the same issue when as a muslim, even MJA was willing to look forward. This man Rajdeep, i feel is worse than Barkha. His hatred towards BJP/all things Hindu is very obvious. Shame on CNN-IBN for having such a man.